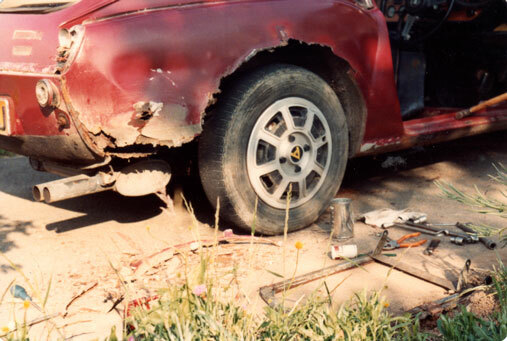 The car was found to be in a much poorer state than initially thought on it's purchase (see below the rear RH wing after much poking with a screwdriver). The sills were equally shot (a copy of The Sun was found in one), so a visit to the nearest British Leyland dealer (Heron Tractors in St. Asaph) elicited the following panels (see below): new sills for both sides, rear RH wing and inner wing, and a battery box. These were welded on by my next-door neighbour (Ken Evans, Ruthin) with the exception of the battery box which I riveted in myself. During the first restoration quite a few other panels were replaced over the period 1980/81 prior to the total respray carried out in the winter of 1981/82 (see list below). 1. Heron Tractors (BL Dealer), St. Asaph, North Wales. 2. British Sports Car Centre, London. 4. John Kipping Triumph Spares, Coventry. 5. J S Chinn, Coventry Rd, Exhall, Coventry (they pressed GT6 bonnets for Triumph). The floors, which were very rusty (and caused a MoT failure), were replaced. I visited John Kipping at his home near Coventry. 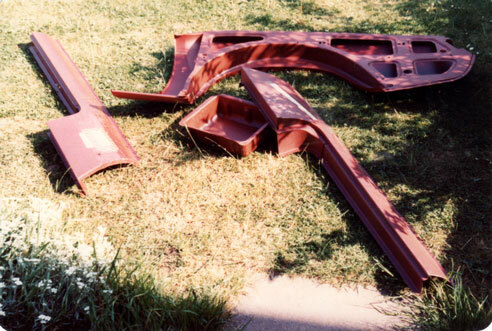 John was then the spares secretary of the TSSC, and his home and garden were full of Triumph spare parts. He took me in his Herald convertible to a body panel maker in Warwick (possibly Taylor Pressform). I then drove to a friend's house in Luton to attend a Party. My GT6 was stolen from outside my friend's house in the night. The floor panels, which were in the back at the time, were thrown into the road. I recovered them and my friend took me home with the panels. Later the car was recovered and I had to collect it from the Luton Police Station pound. According to the Police the car had been to Scotland! In Ruthin I knew a master welder called Brian Yam-Yam (Williams) who used a MIG welder to seam weld in the new floor panels, repair the windscreen frame (also from John Kipping), and later fit new door skins. Repairs were also done to the rear (the valance was replaced) and a respray in Triumph white was undertaken at a friend's house in Lancashire, see below. The newly resprayed car can be seen below.